The following information will help you plan your holiday in Menorca by giving you an overview of the island. 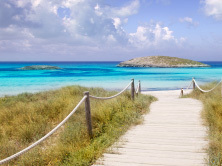 For far too long, Menorca [sometimes known as Minorca] has lived in the shadow of its Balearic neighbours – Mallorca [the largest of the islands] and Ibiza [the brashest of the islands], but Menorca holidays have their own charm. It actually has more beaches than Mallorca and Ibiza combined but they are often more difficult to find. Not that holidays to Menorca are just about beaches, it boasts a array of ancient sites and monuments, many still lying undisturbed. It also has two major towns in Mahon [also known as Mao] and Ciudadela [also known as Ciutadella], both strikingly different, yet both worth a visit. Away from the towns and beaches is a rural landscape and a handful of market towns where life is relatively unchanged. It is not difficult to find peace and quiet on a Menorca holiday, in fact sometimes it is difficult to get away from it! You are never more than a short walk away from a peaceful cove, pine wood or tranquil countryside. Go in winter and you will practically have the island to yourself with only 1 tourist in 100 arriving between the months of November and March. However, you might need to wrap up against the north wind. The paths and minor roads that have criss-crossed Menorca since Roman times provide gentle walking on largely flat land. The biggest challenges are the hills of Monte Toro and Santa Agueda, but even these can be managed by anyone who is reasonably fit. Walking the countryside on your holidays in Menorca, you will encounter an attractive rural landscape of Moorish farmhouses, sheep shelters and drystone walls. Menorcas prehistoric sites are among the most peaceful placed on the island. Most are situated in the midst of farmland and reached along minor roads, although they are on private land visitors have free, open access. The most common monuments include burial chambers shaped like an upturned boat, and large circular structures used as both dwellings and watchtowers. Eating out will be a highly enjoyable part of your holidays to Menorca. In Menorca, food is simple and traditional and is influenced by the foods available for that particular season. 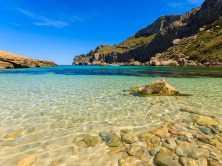 Fresh seafood is plentiful, and although the introduction of tourism has made mainland Spanish and international food widely available, all visitors should enjoy the “real” flavour of Menorca. Seafood is an unsurprising favourite on any island; prawns, mussels, squid, mullet, sole and sea-bass are all abundant in Menorca. However, the most famous dish is lobster caldereta – Caldereta de Langosta [although you can also get fish and shellfish caldereta] which is a rich seafood stew. This dish has become a true speciality and it is said that King Juan Carlos travels from Mallorca to Fornells just to eat the excellent lobster. Cheese in Menorca has been produced since very early times. Roman documents already show evidence of its existence and during the numerous British occupations of the island, it was one of the main sources of food for the troops. Today, its prestige has been recognised both in the mainland and abroad and it has received many awards. Since 1985 Mahon cheese has enjoyed the highest recognition. Look for it in supermarkets – you will be able to choose from mature, semi-mature and mild cheeses. A typical example would be Queso de Mercadel, which is very creamy, with a mild and distinctive flavour. The more matured or curado are much stronger and are sometimes an acquired taste for those used to milder cheeses. Menorceans have a very sweet tooth and produce an array of pastries and desserts. If you have nothing else, be sure to try the almond macaroons – carquinyols – or enjoy morning coffee with an ensaimadas, a fluffy spiral pastry made with lard and sugar. Menorcans also have their own ice cream from Alaior – La Menorquina. Its smooth, creamy taste is highly popular and is now sold throughout Spain. Try some on your Menorca holiday. There are plenty of opportunities for a little retail therapy on your Menorca holidays. Both quality and selection have vastly improved in the past few years, particularly in Mahon and Ciudadela. Leather goods – especially footwear – are probably better and cheaper than elsewhere in Europe and look out for the sales in late August/September when genuine and what can be significant reductions can be found. Also, you will find cheap [although still high quality] pottery items. Try to stay away from shops around the ports and adjacent to beaches to find the best value. Menorca’s pottery was once made from the local clay which, once fired, was a reddish hue. Workshops such as the family run LORA on the waterfront in Mahon harbour produced a wide range of true reproductions of the traditional articles. Not only will you be able to buy the finished articles, but you can also watch them being made.